21st October 1805 was the Battle of Trafalgar. Nelson’s 33 ships shatter a superior number (41) French and Spanish ships, save Britain from Invasion and change the course of history. The British Navy has spent the summer chasing the French around the Atlantic. 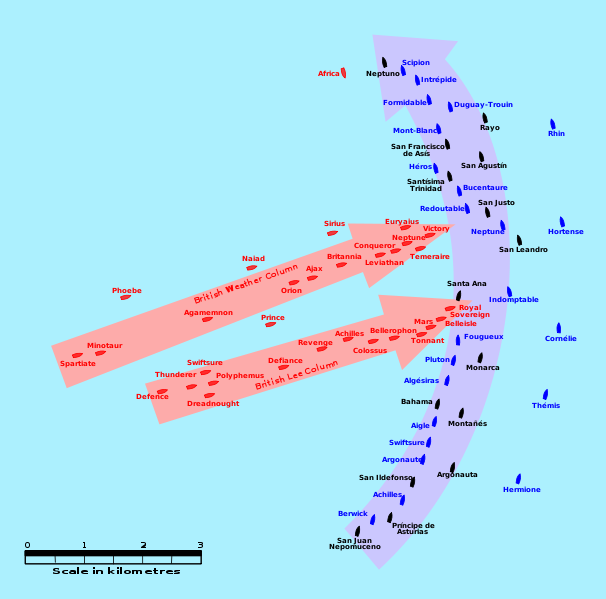 The French had been trying to evade Nelson so they could reach the channel and ferry accross three Corps of troops for an invasion of Britain. 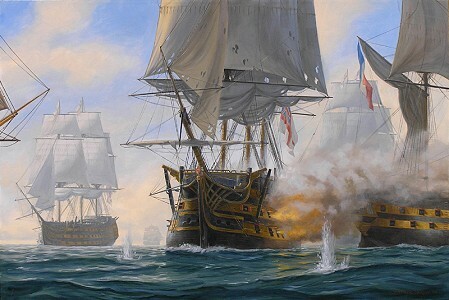 Nelson had prevented this and the French admiral Villeneuve had retreated to Cadiz. In October Napoleon ordered him to sail to Naples and land his men there to reinforce the French forces in Italy. On the way Nelson intercepted them off Cape Trafalgar and engaged them. Historical large fleets of the time would line up and blow each other to pieces. 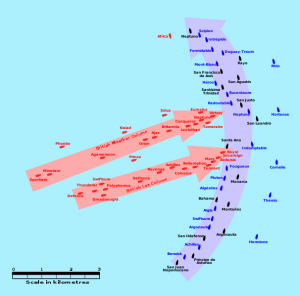 This was a strategy which did not often lead to a results – more an attritional grinding down of the enemy. Furthermore it did not allow for the inferior side to beat the larger fleet. At Trafalgar Nelson had the smaller fleet. It was, however, better trained and the British gunners could reload faster and maintain a higher rate of fire. The Spanish in particular tended to rely on larger number of marines who would attempt to storm enemy ships. They also often had larger vessels with more guns than Britain’s more maneuverable line ships. What Nelson did was to change the rules of the game. Rather than lining up and sailing alongside the enemy he sailed at them from their flank. He arranged his ships in two divisions – Nelson in the Victory leading one division with Admiral Collingwood the second. They sailed towards the enemy aiming to cut the enemy line in two places. Since that would mean a larger part of the enemy fleet would have to turn and sail back AGAINST the wind he hoped to over whelm the rest before fighting the leading elements. “England expects that every man will do his duty”. He then signaled for close action. The Navy was to sail in as close as possible, hold fire until the last moment and then release hell. This is exactly what occurred. The British navy used local superiority in numbers and superior fire power to sink or capture the bulk of the enemy fleet before the rest could turn and help. Over 20 enemy ships were captured- a blow from which the French and Spanish never recovered. the British did not lose a single ship, the French lose 10 and the Spanish 11. 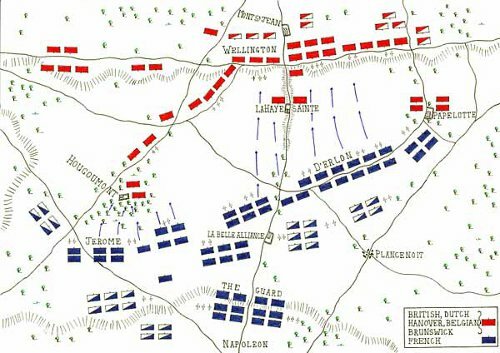 IN total whilst the British lost about 1600 men dead and wounded, the enemy had suffered 13,000 casualties. 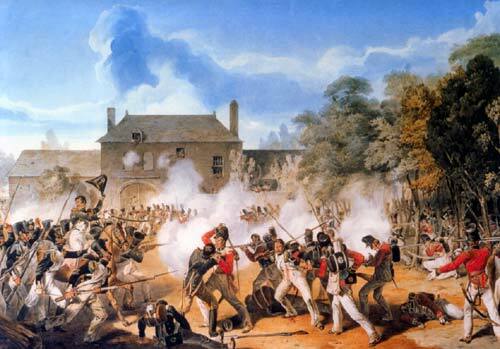 Tragically at the height of the battle a French sniper shot Nelson. The architect of this great victory died below decks knowing he had won. The day after Trafalgar there was a huge storm where ironically many of the ships the British had captured sank. Trafalgar was a pivotal day. It was a huge part of the establishment of Britain’s Navy as supreme world wide (a supremacy that lasted over 140 years until WW2 saw the build up of the Huge US fleets). 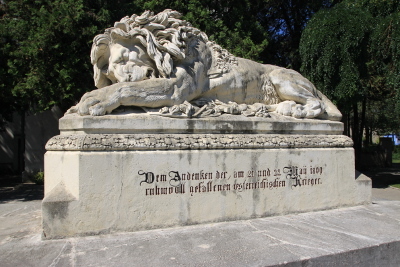 As I was staying in Vienna August 2012 I was able to visit the Battlefields of Aspern Essling and Wagram. 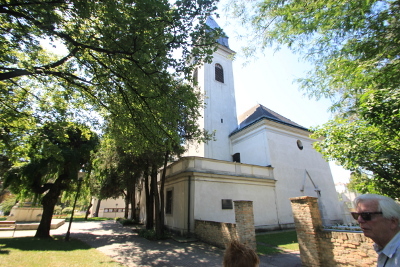 These were the sites of the clashes between Napoleon and Arch Duke Charles. In the case of Wagram it would be the largest battle ever fought up to that moment. This blog is about the first battle – Napoleon’s first defeat. In 1809 Napoleon had never been personally defeated. He had over 12 years fought campaigns in turn against Austria, Russia, Prussia and other states and had beaten them each. 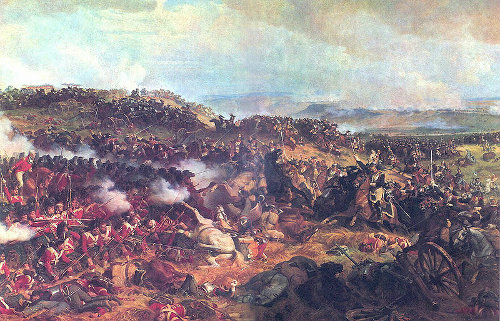 Austria had been heavily defeated in 1805 at Austerlitz, Prussia in 1806 and Russia in 1807. 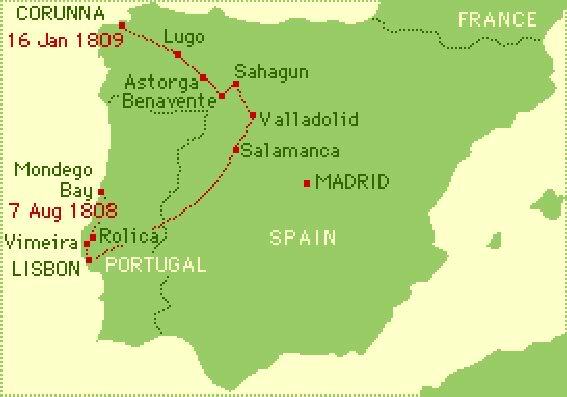 In 1809 Britain alone was fighting France in distant Spain and Portugal. The terms of the defeat in 1805 were harsh on Austria and so in 1809 Austria decided to invade Bavaria (a French ally) to strike back. 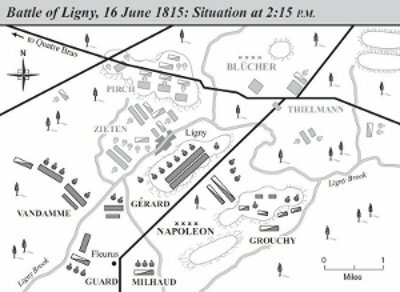 The Austria army in 1809 had been radically reformed after the defeat at Austerlitz in 1805 and at a tactical level could now compete with the French. Its shortcomings were at the strategic level and there were major faults with an over rigid command structure that did not allow for much initiative. This would hurt the Austrians in the long run. Initially the Austrians made advances into Bavaria but Napoleon rushed from Paris to take command and ensured the Austrians were defeated in Bavaria. The French Army now took Vienna whilst the Austrian Army (still mostly intact) was reforming accross the Danube. Napoleon knew he had to cross the Danube to engage the Austrians and defeat them. The Austrians waited on the far side, watching the river and determined to make the crossing costly. The Danube in 1809 near Vienna was a tangle of islands and channels. To cross the river Napoleon had to build many bridges whilst the Austrians were constantly floating trees and even boats down stream in an attempt to disrupt this effort but on May 20th the French began the crossing. The Austrian commander – the very able Arch Duke Charles ordered his Army to march to the crossing point and form up in a great arch awaiting the French. 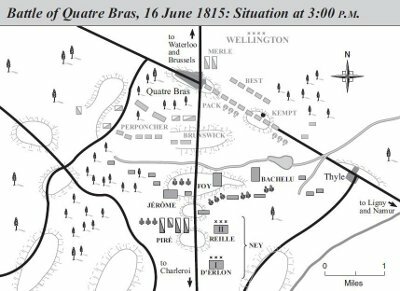 The French were only able to get across 77000 men over the 2 days of the battle due the river crossings being severed on numerous occasions whilst Charles brought 99,000 to bear. The battle began on the 21st May at Aspern withe three Austrian columns assaulting the singe French Corps under Massenna. A single French division in Essling hung on their by its finger nails. To relieve the pressure Napoloeon flung his cavalry into a charge though the center which was repelled but helped maintain control of the villages as night fell. 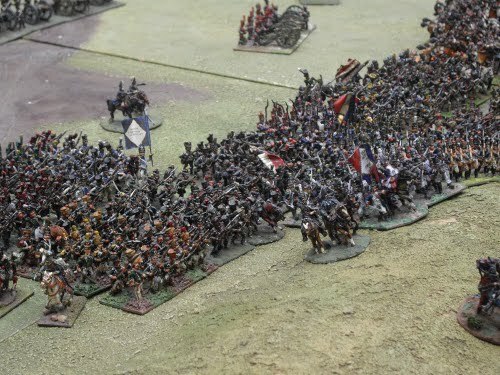 Napoleon attempted to break out by organising an assault through the centre and it seemed to work but at the critical moment Arch Duke Charles is reported as turning up, grabbing a regimental colour and peronally leading the counter attack. In the end the Austrian simply had more men and the French gave way and eventually were forced to retreat accross the river. Napoleon had been defeated and in fact his friend Marshall Lannes who had been heavily involved in the fighting was mortally wounded but for Charles this was only a local victory. He had won the battle but NOT the war. He knew Napoleon would try again. Losses were heavy as a % of total numbers present with 20,000 to 30,000 on each side dead or wounded or missing. 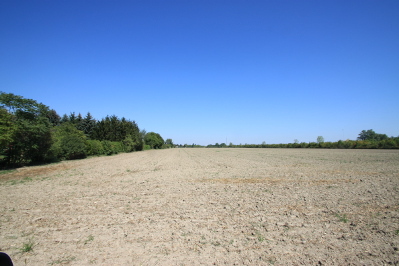 Between Aspern and Essling there is a huge car factory but you can find a field of two that would have witnessed the fight in the centre ground. Looking North accross the flat central ground. 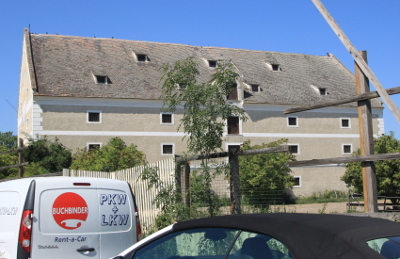 The wood on the left lines the east edge of Aspern. 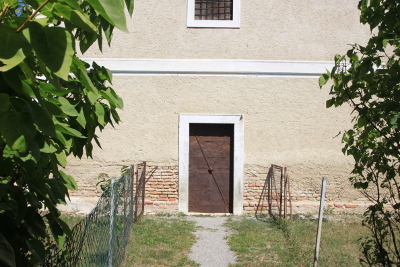 This is where the French attempted to break out. The stone granary at Essling the scene of desperate fighting as the French held it against repeated assaults. So that is Aspern Essling. Next time: Wagram 1809 – the Emperor Strikes Back!